Whether you set the goal of earning Rs. 1 Crore in one day, one month, one year, 5 years, 10 years or 30 years as per your capacity, it is not matter. Matter is "Why did you choose it as your biggest Goal?" It is the matter. Purpose of setting of a goal is important. Reason behind setting any goal is important because if your mind understand the purpose and believe that you have good reason for this goal, you can achieve same goal very fastly. So, if you set goal of earning Rs. 1 Crore but did not know the benefits of earning Rs. 1 Crore, I can help you. Please note it in your notebook or Paste it on your wall. Everyone wants to earn money without working. There is also end of physical active life and everyone wants to retire fastly. But at the time of retire, expenses will more than active life. So, you need money. If you have earned Rs. 1 crore, you can save it in govt. bank and earn Rs. 54000 per month from MIS scheme at the rate of 6.5% p.a. This amount is enough to survive your life. No one can achieve extraordinary goal in life, if he will not live a self-disciplined person. Rs. 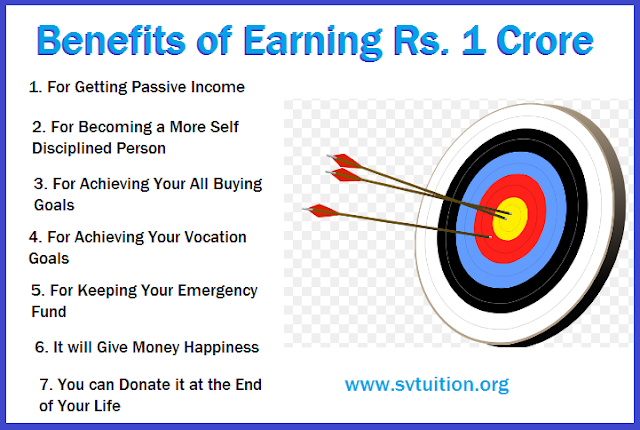 1 Crore is big goal and it can be achieved only if you have the purpose of becoming self-discipline. You can not keep Rs. 1 crore more than one year in your pocket, if you are not self-discipline. By good luck, if you have won Rs. 1 crore or you have won from kon banega krorpati. But if you have self-discipline, it will keep in your possession all time. So, one of great benefit of earning Rs. 1, you will become a self disciplined person from it. You will learn self confidence, become pleasing personality and think accurately. One great purpose of earning Rs. 1 Crore, you can buy what are your buying goal in your life. You can buy a luxury car, you can buy a commercial shop. You can buy your own house. You can buy everything what is your desire. That is the benefit of earning Rs. 1 Crore. You want to go for world for your vocation. Without money, is it possible. If you want your whole life in travelling for visiting different place in the world. How is it possible? Yes, your vocation purpose will fulfil by achieving the goal of earning of Rs. 1 Crore. You should remember, if you will visit a place which you did not watch before, it will give you happiness. So, you will get all time happiness by earning Rs. 1 Crore. Yes, if there is day, then there is night also. There is comfort, then there is sorrow also. Like this, if there is good days, there is also emergency. So, you need money. So, instead begging from other, it is good purpose to earn Rs. 1 Crore and use it at the time of emergency. You know that envy is negative emotion and one of big cause of your stress. You can overcome it if you have the purpose of money happiness through setting the goal of Rs. 1 Crore. This is the benefit of earning Rs. 1 crore. If you have money in your hand. Your all fear which happen due to lack of money will remove and it is the purpose of earning Rs. 1 Crore. Andrew Carnegie had donated his whole money for promotion of free education in America. He told that earn whole life from world and refund it to world through donation at the end of life. That is the purpose of earning Rs. 1 Crore.